The head of the department of public relations and media policy of the Institute of Public Administration and Management (IGSU) Felix I. Sharkov., professor of Shukran Suleimanova, Professor Elena Nazarova and Senior Lecturer Sergei Ryumshin attended The International Muslim forum, which was held in Moscow. The 10th International Muslim Forum "The mission of religion and its follower’s responsibility facing challenges of our time" was held in Moscow from 10 to 12 December. The forum was organized by the Spiritual Administration of Russian Muslims, the Council of Muftis of Russia, the Fund of Islamic culture, science and education, as well as the International Union for Muslim Scholars. The delegates were discussing various topics during three days. Among them were «the mission of the religion and its follower’s responsibility». The Muslim forum was opened by the representatives of all main confessions. All of them agreed that regardless of religion, humanity faces a lot of common problems that can be solved only by uniting efforts. Ravil Gainutdin, the chairman of the Council of Muftis of Russia, said: "There are attempts to create a unipolar world and someone tries to spread fear among people - the Taliban, The Islamic State of Iraq and the Levant and various terrorist organizations, which are threaten to destroy the world. During the break between sessions Ravil Gaynutdin discussed with Felix Izosimovich Sharkov the problem of interfaith communication in modern Russia. 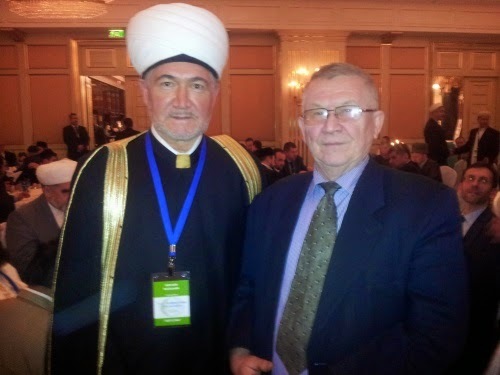 The International Muslim Forum was held in Moscow for the 10th time. The event consisted of scientific conferences, discussions and films watching. On 12 December - the third day of the forum –the discussion of topic: "The Role of the Muslim community in the development of Russian statehood, strengthening the unity of the Russian nation" took place. Felix I. Sharkov was the moderator of the section, in which professors Elena Nazarova and Shukran Suleimanova and the senior lecturer of RANEPA Sergey Ryumshin participated. It should be noted that after the forum, students expressed their gratitude to the administration of the Department of Journalism of RANEPA for the opportunity to be participants of such forum. The events of recent decade attracted extraordinary attention of the academic society to the issues of interaction between Islam and politics. In this context various examples of Islamophobia are analyzed. There is a need of training journalists to make materials connected with religion, facts and opinions. Consequently, it was noted at the forum, that the RANEPAs approach in training future journalists is correct.